Cucumbers, Radishes, Microgreens, Kale, Lettuce, Hearty Greens, Turnips and/or Chard (depending on how they are doing on Wednesday morning). It is still very early for cucumbers, but we like to grow an early season crop in our greenhouses. We talk about how unique it is in our Instagram post found here. Cucumber Kimchi – We know this is an off-the-wall Korean condiment, but we really love it. Some say it is an addictive hot-dog topping. We love it with eggs and on top of salad and along side any meal. If there is any way you still have Garlic Scallions around from last week’s share, they are perfect in this kimchi. Microgreens – These nutrition-packed babies are perfect anywhere: On sandwiches (with hummus or any sandwich fillers), on top of larger-leaf salad, on top of pizza, on top of soup, or mixed in with scrambled eggs. These are the baby plants of kale, collard, kohlrabi, cabbage, and mizuna, which are shown to be up to 40 times as nutritious as their adult counterparts. Radishes – Cilantro Radish Salsa (listed as part of Steak Tacos – sub another form of protein if you wish) or try Ghee Poached Radishes, served with any salad greens. Turnips – if the turnips end up being ready for picking (they are borderline as of this morning) and you are new to our CSA and/or these turnips, you are in for a treat. We grow a super-sweet and tender Japanese variety called Hakurei. They are great raw on a salad or super tasty cooked. We recommend cooking them with butter and salt – on the stove top or roasted in the oven. They are delicious as a side for any meal or served on top of any protein. Try this Roasted Turnip recipe with poppy seeds, or try this Glazed Turnip recipe. Hearty Greens or Chard – We’ll just keep saying it: we love these in a simple saute with butter, salt, and onion or garlic. We serve this a lot. Both of these greens are perfect in green smoothies. See guidance here or a recipe list here. Available for Market Share CSA members to choose from this week: Cucumbers, Collards, Garlic Scallions, Hearty Mix, Radishes …and Pepper Jelly, Fermented Jalapenos, naturally leavened Hearth Baked Bread. PLUS Plants: Cilantro, Dill, Basil, Parsley, Cucumbers, Yellow Summer Squash, Zucchini, Tomatoes, Eggplant (variety details on ordering page). 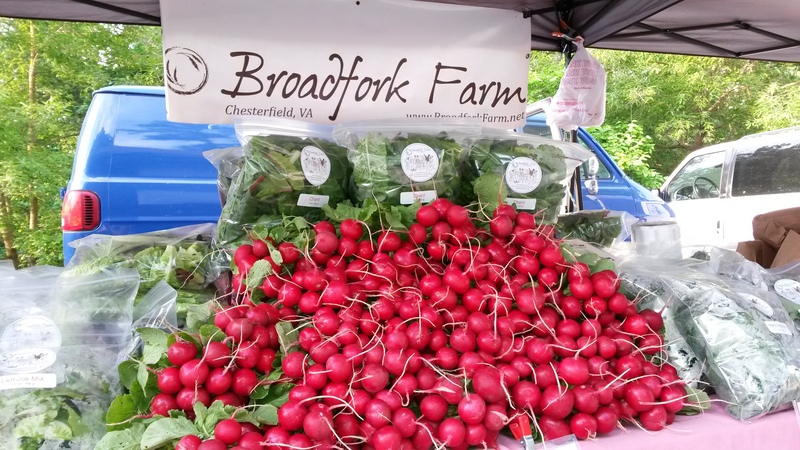 2015 Market Share CSA Members: Reserve your selection online to pick up on Wednesday, May 20th at our farm, in Church Hill, or at Good Health Herbs.